I saw her book, My Favorite Things at Bookshop Santa Cruz last Sunday night, on a staff recommended shelf. I watched a TED talk on her the next morning, and thenI bought all of her books they had at Bookshop Santa Cruz. Nothing like a good addiction, especially when it is also supporting the local economy. I am connecting with so much: her Russian Jewish heritage, the story telling, her color sense. She is easy about giving herself permission to wander, to get off the assignment, and amble. Walk and see. Her sense of freedom and the wisdom of all that strikes me as generous, lovely and brilliant. I can’t wait to read the kids books to Des and Ellie! 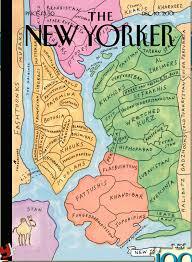 She is the one, along with Rick Meyerowitz who did the New Yorker Cover New Yorkistan that was so fantastic in 2001. It brought some much needed smiles to our faces. I have become the President of her Fan Club.